2017-06-28 - You'll Deschutes Your Eye Out! 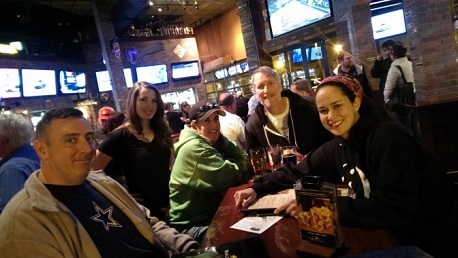 So Wednesday night was PubGuys Trivia night as usual, but this time Deschutes Brewery was our featured brewery for the evening. Kyle from Deschutes was in the house to talk about all the great things happening at Deschutes up in Oregon. In addition to providing many teams with some samples of the tasty beer Deschutes provides, he was also throwing some knowledge their way and helping some teams out with trivia hints. As if that wasn't enough, the Power Hour winner was going to win some awesome prizes from Deschutes. Game one saw Quiz in My Pants just edge out Falcon Punch for the top spot, thus setting the stage for an awesome showdown in the Power Hour. With all other teams nipping at their heels, these two teams separated themselves from the pack once again, only this time, they ended up tied at 30 points after the famous PubGuys Kitchen Timer Question. In a flash, the tiebreaker was completed and our victor was announced....Quiz in My Pants. And just so you can tell the caliber of players and people we have each week, Quiz in My Pants split the prizes from Kyle and Deschutes with Falcon Punch in the ultimate gesture of sportsmanship. For an easy Scavenger Hunt bonus point, tell me the original name of the location where Deschutes Brewery recently announced they intend to open up east coast operations.